1) “Congratulation to Steph and you and your fellow volunteers!”; for taking on the huge task of watering down so many runners at Mile 3(and all the drama that came with it). I’m sure that was an wide-eyed moment as they came rumbling in. 2) Congratulation to the 35,000 runners who stood 26+ miles from the finish line with high hopes for the day. It takes courage to get that far. 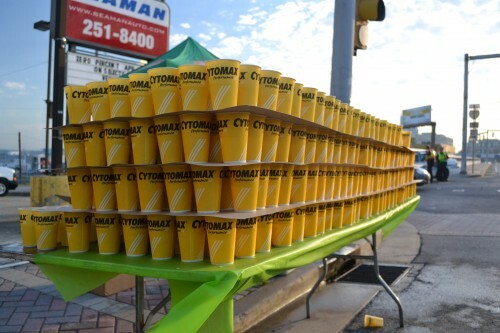 3) Fantastic picture of the 4 layers of cups. You have a interesting queuing theory problem with watering everyone. You have an arrival function (maybe a binomial distribution – bell curve). You have a quantity of pre-filled cups and a refill rate. Building a model around those variables you could either predict how many more pre-filled cups you would need, or how many additional volunteers to maintain a supply of filled cups. That would make a nice little paper/display for a science fair program. 4) Let’s make a bold assumption that by mile 3 the runners have set their pace for the day. The leaders will come roaring by around 18 minutes. Honorable effort runners cruise through around 27 minutes. Struggling but still with fading hope around 40 minutes. So at the 45 minute marker, it might be good to suggest that the water cups be removed, to be replaced with a bullhorn suggesting that it will take them another 5 to 6 hours to complete the race, and they should do the right thing and save their dignity. Maybe it wasn’t their day, maybe they thought it was a 5K, maybe they just got caught up in the euphoria; but the race officials and the crowd that lines the remainder of the course should not have to endure watching the thrill of victory turn into the agony of defeat. 5) It’s hard not to LOL concerning the last story about the distressed runner, but again maybe the race committee needs to step in and save people from losing their dignity. Absolutely one of my favorite posts! Water / Cytomax stops are killers. It’s definitely the hardest volunteer job on the course. If I was too out of breath at the time to say it…I will say it now….THANK YOU!!! All the drink stations were life savers and I realized about half way through the race that we all probably seemed very unappreciative and overly needy and messy. You guys ROCKED!!! Why thanks Laura! 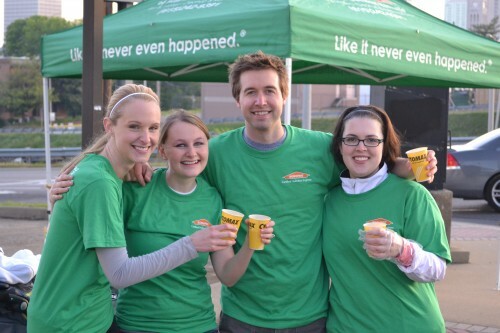 We had a blast, and truly no thanks even required on race day – it’s hard work running that far that long! I need to have you as my scientist in resident on this blog to explain all of the scientific conundrums I get into. 🙂 And next year I’m bringing a bullhorn. Great post!! Thanks for volunteering! Thanks Matt……I needed a laugh today! You sum up, and quite nicely, the experience. I was laughing out loud at the British lady! Hi Matt, thanks for capturing our crazy experience! It was fun working with you, Steph and Jess! So funny! AWESOME. I’m still laughing about the British woman… Well you did a 5k this year. Maybe a marathon is in the future. Here’s to hoping!! !